After skiing at Snowbird for a couple of days, we decided to take the kids to a few National parks in Utah. Utah has so much to offer even in the winter that I was thrilled to take a break from the snow and see some amazing sites our country has to offer. 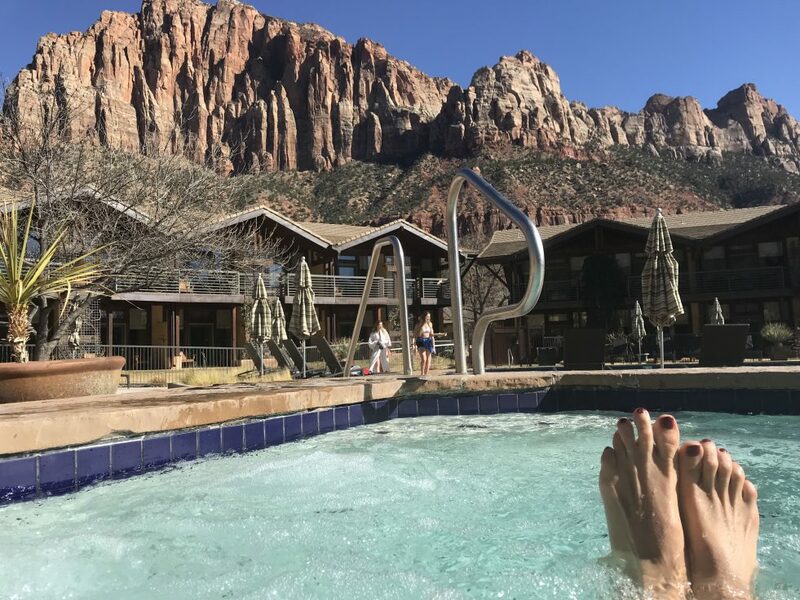 My husband booked 3 nights in a hotel in Springdale, the town right outside Zion National Parks gates. With a four hour drive from Salt Lake to Zion, we decided to take a quick trip on our way down. 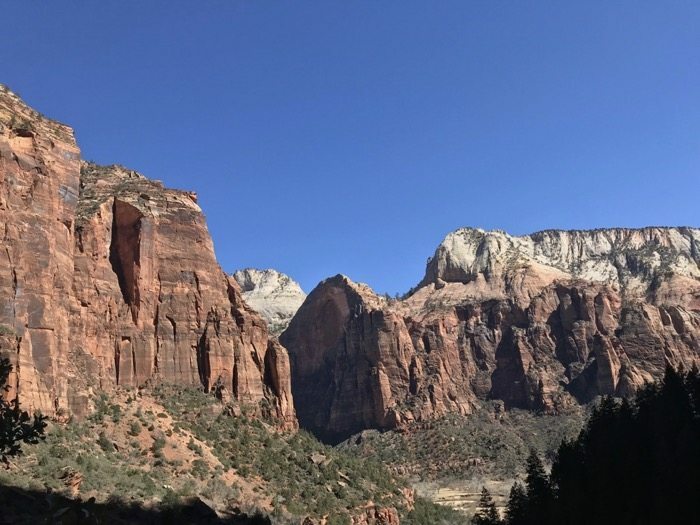 Here are our Tips For Visiting Zion National Park for Two Days as well as some family-friendly hikes. Also be sure to check the Zion Park website for any road closures or pass information. We immediately stopped at the Welcome center and told the park ranger we had about four hours to explore the park. They were super helpful in suggesting a few trails and must-see stops that would fill our time out perfectly and expose us to the crimson-colored hoodoos, which are spire-shaped rock formations. The park’s main road leads past the expansive Bryce Amphitheater, Sunrise Point, Sunset Point, Inspiration Point and Bryce Point. Our first stop was Sunrise Point where we took a quick hike down to the Queen’s Garden a 1.8 miles round trip hike. Pace yourself, all the hikes at Bryce start downhill which means you have to hike uphill to get back to the trailhead! We then stopped at Inspiration Point and lastly Bryce Point. Some of the high viewing areas were closed due to snow but even we were able to see everything very well. We then headed to Zion National Park. The drive between the two parks is worth the trip to Bryce. You actually have to drive thru Zion to get to Springdale. We would have never seen this part of the park if we did not go to Bryce as this is not the main road in Zion. We woke up early the next day and since we could still drive the park, we packed up lunch and headed to the visitors center. We were told to drive to the River Trail (1 mile round trip) which is actually the starting point of the Narrows Hike. Since the water was 43 degrees we definitely wanted to check it out before we committed to renting dry suits. Our Next stop was weeping rock. This trail is only about .5 mile round trip but worth seeing. From there we decided to hike the Hidden Canyons Trail. This trail, like Angels Landing which we did not do, involves hiking up the side of a mountain with chains. No one in our family had any issues with this and saw much younger children doing it. (that made me nervous) . We took a lunch break then decided to hike to the upper pools. Definitely worth the hike all the way to the upper pools. Be sure to bring enough water and snacks for the entire family when hiking. Even though we had cooler spring temps, the air is dry and you get thirsty. Head back to your hotel and enjoy a little sun and relaxation. A hot tub does wonders for sore muscles. These three hikes gave us a great perspective of the hike. If the Northern Rim of the Grand Canyon was open, we would have been satisfied with our Zion Experience. 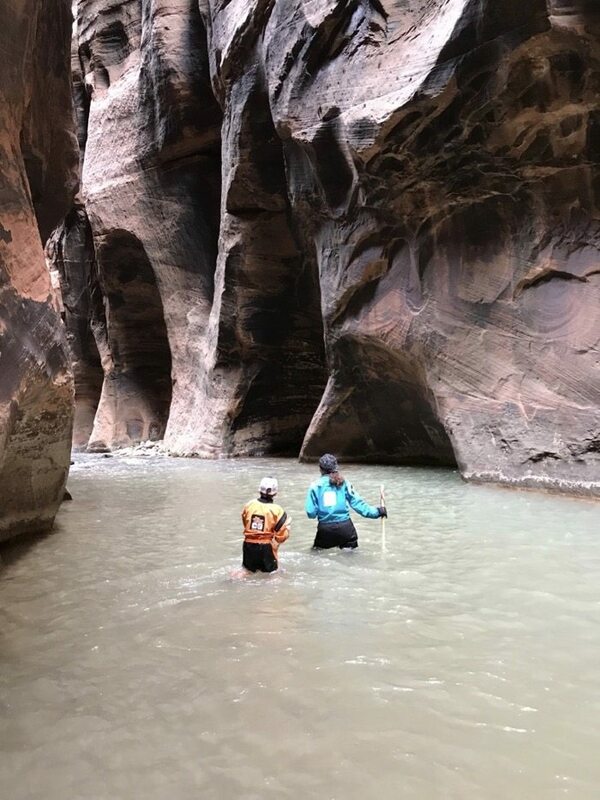 Since we had one more day at the park, we decided to hike the Narrows, a 6-mile round trip hike through a river. You are literally hiking through a river! Be sure to rent your equipment the day before as they do sell out. This hike took most of the day and it was not only tiring but invigorating and amazing to hike such a unique area. Definitely, do this if you are visiting Zion. Your kids will be exhausted afterward, so be sure this is the only hike you intend to take that day. Pack plenty of water and lunch/ protein bars so you can take a brief break to regroup. I hope my kids appreciate the beauty of our country and enjoy the hiking experience. While you can drive through many national parks, it is well worth getting out and taking at least one trail. Be sure to pin this to reference when you plan on visiting Zion National Park. If you plan on taking a National Park Family Trip, this usually requires multicity travel. This can be challenging to find the best flights that might also include a layover for a few days. I recently found AirWander is the only flight metasearch engine that adds stopovers. Its unique twist changes the way people travel by helping them see more of the world for less. A stopover is bonus destination for 24 hours or longer and often creates flight savings. AirWander saves on average 45% on flights when a stopover is chosen with predicted savings.